The Mocha Storm Clownfish is a Sea & Reef signature designer Clownfish. It is the second designer clownfish in our Storm line and was made available to hobbyists on January 22, 2018. 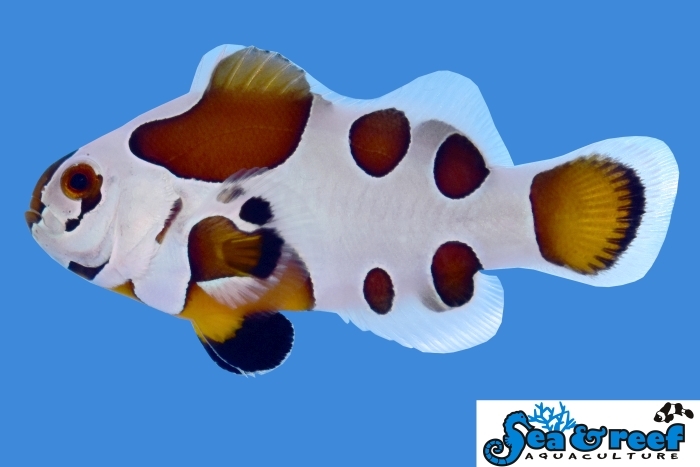 The Mocha Storm Clownfish was created by breeding our Black Storm Clownfish with our bright orange ocellaris. The result is a clownfish that shows the characteristic white pattern of the Black Storm Clownfish, but with a Mocha coloration instead of the deep black color of the Black Storms. The brown color of the Mocha Storms Clownfish is a perfect blend or orange glow and freshly brewed coffee (see image below). The temperament and captive care requirements of the Mocha Storm Clownfish is very similar to that of the regular Ocellaris clownfish. It is a relatively peaceful and hardy clownfish. They thrive in saltwater aquariums with or without an anemone present. Mocha Storm Clownfish will readily accept a wide variety of host anemones and many hobbyists keep it with the popular and hardy Bubble Tip Anemone (Entacmaea quadricolor). As a reference the natural host anemones of the regular ocellaris clownfish are Magnificent Sea Anemone (Heteractis magnifica), Sebae Anemone (Heteractis crispa), and Giant Carpet Anemone (Stichodactyla gigantea).